Posted by Chris Thompson in Travel Log. Two weeks ago I helped with my first medical team. We set up in churches or open-air pavilions every day and people who were given numbers previously would come out to get medical attention. Even though I’ve loved the construction projects and bible schools that we’ve been a part of, I think the medical team was some of the most rewarding work. People come in with a problem and walk out with a solution. Watching how much our team was able to accomplish in just a week ALMOST makes me want to do something medical… but the nightly stories of the ER work they’ve done killed that thought pretty quickly. Being an engineer still wins out! We took them to the airport on the 9th and had our first official free day (day without a team) since May 30th! We spent the day cutting grass and getting the camp ready for the next team, my church team from Vidalia! I was able to go to the airport and greet them when their plane touched down on Wednesday. It’s the first time that I’ve seen someone I know since May 5th, so needless to say I was pretty excited. When they walked through the terminal doors Kyle Fabacher, a future Georgia Tech student and a dear friend, dropped and tripped over his bags in his attempt to run to greet me. Good reunion. My team consisted of twelve males and four females, and they were ready to do some heavy work. Part of our guy group was going to work on the roof of the dining area to build a washroom, and the other part of our group was going to be working with me to build large concrete poles that will eventually support an electric fence that will circle the camp. The ladies were in charge of priming and painting the inside of the dining area. The concrete pole project was the first project that I was given complete leadership over, so I was pretty intent on finishing on time. We had four work days to build eleven poles, and with the supplies we had three poles were the most that we could set up in a day. Thursday and Friday went well and we stayed on task with three poles a day. By the end of Thursday, though, I started to feel fairly sick. By Saturday I was extremely ill and didn’t feel like moving. However, Saturday was the day the team was going to visit the Batey, and I had a couple of kids that I didn’t get to say goodbye to before. I packed an extra bag (throwup bag) and sat in the front of the bus and prepared for a difficult two hour ride. I didn’t know how I would handle seeing the kids for the last time. Before we arrived at the Batey I was upset; I didn’t want to say goodbye. Right when we pulled into the area a surge of happiness hit me. I’ve had the opportunity to know by name and be known by these beautiful, joyful kids. I’ve been blessed beyond belief in being their friend. I stepped off of the bus excited to see all of my friends one more time. The universal language for children is tickling. Even my group of thirteen year old boys that I play with speaks the language. I made one particular friend, Lody, in my adventures at the Batey. After we team-tickled a couple of the other boys we began to be attacked by multiple people at once. I jumped behind Lody and stuck my arms in front of him and yelled “Cuatro brazos!! !” (translation: four arms!!!) and he died laughing. They rest of the time he would yell “cuatro brazos!! !” and I would jump behind him and we’d fend off the other boys that would try to jump on us. These kind of games continued till I started feeling too ill to play. The diagnosis given to me is a typical Dominican ailment: parasites. My group is fantastic with the children, probably because their hyperness and joy almost matches that of the children in the Batey. For the rest of the day I was content to sit and watch my group move from being disturbed by the conditions in the Batey, to determined to give the kids a good day, to reckless abandonment to make the children smile and laugh and feel loved to the highest degree possible. Everyone had a child on their shoulders; some had four or five hanging off of them. They ran around and flipped children and took pictures and sang and danced and did anything they could do. They couldn’t give any physical gifts to the children… to do so would start a brawl. But they gave what they could – happiness and love. While I was sitting there the kids that I had grown to know would periodically come over and sit with me and check with me, then go back to join the games. It was one of the most humbling things I’ve experienced, being asked by a thirteen year old boy who lives in the Batey if I was okay. We eventually had to say our goodbyes and leave. After being tackled and hugged by all of the boys that I love and then picking up and hugging all of the little girls that I adore, I got on the bus from Batey Seven for the last time. The rest of the trip flew by. My parasite friends decided to begin a campaign to take over the rest of my stomach, so I was bed-ridden the next day while my group went to the beach and church. While I would have liked to be with them, the day was good to think back on my trip and reflect on how my life has changed and how it will look once I arrived back here to the States. Monday and Tuesday I sat and watched my team finish the work that we had started (and that they finished). Tuesday afternoon I ended up getting an IV with two bags of fluid to counteract all of the fluids I had lost. I hadn’t eaten any food since Friday night, but the food smelled so good that night (and it was my last night) that I ate just to taste it. Five minutes later the food was back out of me, but it was worth it. My last meal there. “Well done, my good and faithful servant.” Those are the words I want to hear. 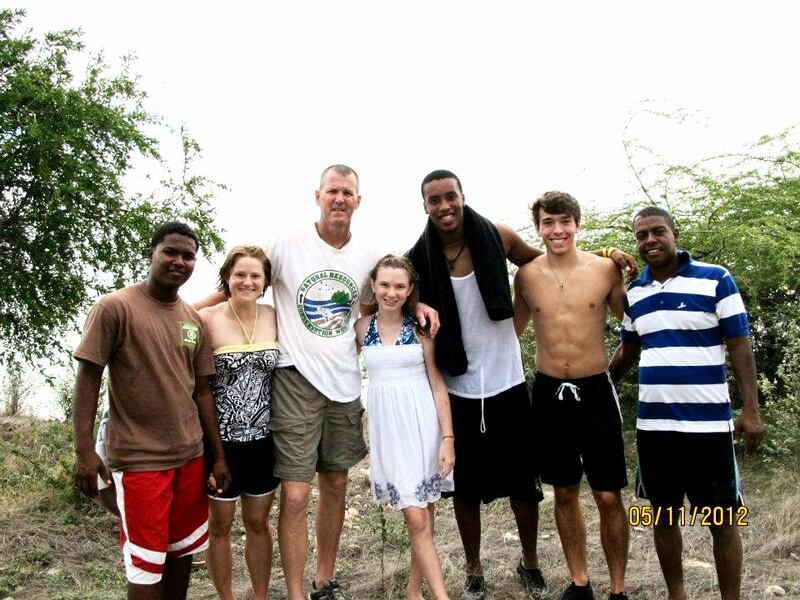 Summer 2012 in the Dominican Republic, life changing trip number three. I write in a journal everyday. At the top of each page I always write the number of days I’ve been here and what day it is. I am past day 50, and that’s a scary thought. I don’t think I’ve ever wantedsummer to last longer than I do right now. How will it be possible for me to return from this and go back to classes? I know it’ll be good, I know I’m supposed to… but I don’t know how I’ll be content with it. We shall see. I’m writing this with a touchscreen, so please forgive me now for any typos. We are back at the Playazul, the hotel in Barahona that we stay at when we work in the Batey. To fill eveyone in, lastw eek we had a team from Waynesboro, GA, come for 10 days. The main project was to take 14,000 lbs of cement mix, around 28,000 lbs of sand, and who knows how much water, hoist it up onto a roof, hand mix it into “mecla,” a crude form of concrete, and spread it out to form a waterproof cover on the roof of the building. Other side projects that we worked on included building and installing screens for a dining area, building and installing shelves for a storage room, painting four rooms, and holding a VBS program at a nearby village. It was a lot of work, but I can’t recall a single minute that I didn’t enjoy. During the week a group of mostly Dominican boys challenged the team to a basketball game. Being humiliated by the guys on the court wasn’t going to be enough, so the wager was the losing team would have to get their nails painted. Soooo the game began – competitive, experienced Dominican team vs. goofy, inexperienced (that word doesn’t even describe how bad we were) American team. Playing to 30, halftime at 15, street rules (fouls must draw blood to be called a foul). First half ended with us down 15-0. You read that right. We changed our tactics when the second half started. They had one player, around 6’4″, who was driving every time. New tactic was for me to keep him outside of the three line. Keep in mind I don’t play basketball. Never have, don’t now, probably never will. But I held up my end of the bargain, he didn’t get close enough to lay it up after halftime. It didn’t bother him though… He just sank 3’s instead. Final score – 30 to 24. Pink nail polish for the American team. They had to return home (through customs) with it. We dropped them off and picked up the next team, also from Waynesboro, to head back to Barahona with us. We’ve been working here since Saturday. I thought maybe this would get easier on the second trip… Wrong. Just when you think you have gotten used to the sights and sounds and smells of the Batey, a kid (who is barefoot) wants to take you walking and ends up leading you through yards and trails that are covered in human feces and glass. Of course the kid is just laughing and telling funny stories about the people that tehy walk by. Is it possible to get used to that? It’s a miracle that I was able to remember names. I’ll start by saying I a terrible with names. Spanish names? Even worse. But thankfully I was able to remember most of the names of the swarm of kids that ran up to us when we pulled back into the Batey this Monday. Thank you Lord, because I didn’t want them to feel forgotten. And to be honest, it felt good to be remembered by them too. It’s funny to have progressing relationships with people who I can barely speak with. The boys went from just saying my name and smiling to calling me old and acting out me having to use a wheelchair. The girls went from bashfully avoiding me to trying to jump on my back whenever I make the (purposeful) mistake of sitting down somewhere within their reach. We’ve worked on installing trusses on the church and then tinning it. We also finished re-installing new tin on Alberto’s house. You wanna talk about joy? Saying the man was joyful when his roof was finished doesn’t even come close to describing it. The group decided to bear the burden of fundraising to provide the money for supplies to finish his house. The groups love being a part of the work, so to sacrifice the experience to get the job done as quickly as possible shows a lot of love. They’ll probably never see the finished result, they probably won’t talk to Alberto after the work is done, but it doesn’t matter to them. They see a need that can be addressed and decided to address it. That’s a good example for the rest of the Church. Later this week we have a baseball game between the Dominicans and the Americans scheduled. I’m okay with that, but this time we’re hiding the nail polish. I’m not going through that one again. The whirlwind started! Two weeks ago we had our first team arrive. They were from Edmund Burke Academy, the school Mady went to when she lived in the states. There were five adults and five high school kids on the team, so it was relatively small. The first day we worked on making and pouring the concrete floor for Mitchell’s house. We were able to finish in a half day, but at a pretty steep cost. A majority of the team ended up getting sick from (I’m guessing) a combination of the heat, food, and hard work. We ended up making a “sick ward” in one of the dorms so we could take care of them… Everyone ended up getting better in a couple of days, but that was only after we put IVs in a couple of them. Aaaaaanywho, after they got better we worked on priming the inside and outside of the house and painting a couple of rooms at the camp. On our free day we traveled to Batey Seven. The Bateys are extremely impoverished communities near the Haitian-Dominican border. Years and years ago companies pulled in Haitian immigrants (often illegal immigrants) to work the sugarcane fields that are on the Dominican side of the border. The workers lived in little “villages” that are now the Bateys. The companies have been replacing the workers with new machines though, so the poverty level has gotten even worse. Batey translated means “Place of Suffering.” They literally live in “Place of Suffering number Seven” or eight or twenty. When the Beardens started coming to the DR around 13 years ago they worked in Batey Seven. When they first got there the health of the community was so bad that when kids threw up you could see parasites crawling in it. Now they have a health clinic (that gives free medicine), access to clean water, a school, and so forth. Even on this trip, though, the obvious need of the community is… well… obvious. I visited last year, so I knew what to expect. The kids mob up when we get there. They don’t ask for food, for money, for clothes, for anything. They just want to be held. They come up to you and grab onto whatever they can reach. We just walked around for about an hour when we visited, and I never had a leg, hand, or patch of arm that wasn’t covered with a child. I will never do the description of the Batey justice. They have nothing (literally), but still laugh and love and enjoy life more than almost everyone I know in the states. We have a lot to learn. We took EBA back after a week and picked up team number two the next day. This group was an adult group from Grace Fellowship, a church in Greensboro. I was amazed at the experience that was represented in the group. Most of them have been on trips here at least a couple of times, about half of them have come on around five trips here. Almost all of the guys work or have worked in construction. And every single one of them was incredibly open and loving from day one. This group was scheduled to work in Batey Seven. A man named Alberto is the pastor of the church in the Batey. I’ve never met a harder worker than Alberto. He is considered a “master” (an actual title here) stone mason, and when he starts a job he works till dark. His house is open to his kids (ten kids) and their kids, so it is always chop-full of people. Two bedrooms (two beds), a kitchen, and a “living room” of sorts houses the entire family. Our group split into two. The other group worked at the church and medical clinic on various tasks. They painted the clinic, cleaned and sealed the roofs, laid forms for new beams to go across the roof, and built trusses. We worked on extending one side of Alberto’s house so that his family would actually fit (or come close to it). We laid block and built the walls of the new side, tore down the old roof, lifted and scabbed the crossbeams, and then re-tinned the house. The best part of working in the Batey is, hands down, the children. I didn’t think that I would be able to work at all. How do you separate yourself from a small, hungry, half-naked child to go work? How do you put a kid down to go eat in a building with bars on the windows while kids hang from the bars and shout out “Americano! !”, how do you ask them to let go of your hand or hop down off your back? Lucky for us, the kids love to help. I think the eight to ten year old boys that followed us around made more concrete and moved more blocks than the rest of us. The worksite was constantly bordering chaos because the kids were proud to work beside us. They were proud to work, proud to extend a helping hand to one of their own. They loved showing us the tricks of the trade. More than anything, they loved being recognized. I tried to learn as many names as possible. After the second day they started quizzing me on their names. A swarm of twenty little boys would run up and start pulling on me and they would all be shouting out “como me llamo??? ?” I would try my best to go through and say “hey _____” with their names. The joy that leapt across their face when they realized that they were known was priceless. We think they need our help. We think they need our medicine, our water, our structures, our clothes, our standards. No. False. Wrong. Compare their lives to ours. We think their river of blessings is running dry and ours overflows, but that’s only by our standards. Compare their joy, their love, their faith that life will work out, and their contentment with ours. We lose. They don’t need our help, and they don’t even really want it. It’s not what they want most at least. The most important thing to them is the look in the eyes, the smile, the pat on the back, the hug, the acknowledgement that they are human too. We have a lot to learn from them. Day 23! This is the last Lord’s Day before the first team gets here. Monday we have a team of 40 Haitians coming up for a week-long camp, and then Wednesday the first team from the States that I’ll be here for will be getting here. The plan (as I understand it) is that the team will be working on pouring concrete for Mitchell’s house, the night guard for the camp, painting rooms at the camp to prepare for the youth camps that will be taking place here in August, and holding day-long camps for some of the kids who live in Bani. After the team gets here we’ll have teams here straight through… the end June I think. Let the games begin! We’ve got the camp here pretty much set up for everything that will be taking place soon. We worked all last week to clean and scrape concrete and haul everything off to make room for all of the lumber and concrete bags that will be coming in soon this week. Tomorrow we have one more landscaping day (mow mow mow mow mow), and the camp will be ready! Today we’re taking the day off though. I think we’re planning on going to the beach in an hour to go snorkeling. I went snorkeling for the first time a few weeks ago. We drove an hour to completely deserted beach that was gorgeous. There was coral right off the shoreline that had schools of little, colorful fish everywhere. I even found my first shark’s tooth! The peacefulness of the land here is amazing. We just drive in silence most of the time to admire everything around us. Most of the main roads have a decent amount of trash along the sides, but once you get off the beaten trail everything is untouched. But the trails may be untouched for a reason… Mrs. Donna sat down in the sand last time we went and was covered in bite marks. Beach fleas exist? Oh joy. Just an excuse to stay in the water. Haha. I apologize ahead of time for the length and lack of flow of my first post. I’ve got to get used to writing again. I guess I should start with some basic info on me. I’m Chris Thompson, a third year Mechanical Engineering student at Georgia Tech. I was born and raised in Vidalia, GA, home of the famous Vidalia Onion. I’ve never really liked onions though… but anyway. The summer after my senior year of high school I had the blessing of being able to go to Peru for a week-long mission trip to help build a house for a family of around 12 people who had been living in a tent for a couple of years. A lot of people in church get caught up talking (too much sometimes), and I was definitely one of those people. But on the trip I saw the value of simply coming together with other people to work and give to someone who doesn’t have anything. Life changing trip number one. Last summer I went to the Dominican Republic for a week. A family from Georgia had just moved down to become full-time missionaries. John Bearden, the father, Donna, the mother, and Mady, the 12 year old daughter, gave up a huge house, a town of friends, and a life of comfort to serve God in the Dominican Republic by serving the people of the Dominican Republic. The parents have been coming on trips to the Dominican for around 13 years, and they had invested a lot into the country already. They were given a run-down camp to base their operations out of. I was part of one of the teams who worked on the camp and built a house for the Beardens to live in. After the week I asked the Beardens about the possibility of me coming back down on my own next year to help continue the work we started. Life changing trip number two. Now, one year later, the camp is (mostly) operational and their house is complete…. and I’m back! My job while I’m here is to help the Beardens lead the work teams that will start coming in on May 30th. The camp has multiple dorms that allow the Beardens to bring in teams to work. We’ll be working on construction in three places: the camp (that sits just outside of Bani), houses in Bani, and Barahona (a town that sits close to the Haitian-Dominican border). We’ll be installing water purification systems, building houses, repairing roofs, laying lots of concrete, guiding medical teams into Bateys, and other tasks. This will be life changing trip number three! I imagine most blogs start off around day one, but I came down the day after finals finished and didn’t set everything up in time. I’ve been here since May 5th, so I have a bit of catching up to do. I’ll make it brief to keep down the size of my first post… I don’t want to scare everyone off in the beginning. Right now I’m housed in one of the dorms that will be filled with teams in a week. Two Dominican youth are at the camp to help work and translate: Freddy, a new addition to the Bearden family after they adopted him this past year, and Juanluis, a 20 year old from the north side of the island. I also have fellow American intern, Haley, who is a graduate from UGA, here with me. We’ve put aside our school differences… for now. We’ve all been working to get the camp ready for the flurry of teams that will be arriving soon. Mowing, plumbing, installing a roof, moving and preparing supplies, making concrete, moving concrete, placing concrete, scraping up dripped concrete… just lots of concrete-related tasks… we’re doing all sorts of things really. I’ve learned a lot about Dominican-style construction already, and we haven’t even started most of our projects! I’m extremely thankful to be on this trip. I know that two one-week trips changed my outlook on life immensely so I can’t even fathom how much two and a half months here is going to do. All I know is that today is day 19, and I can already feel a change… I’ll get into that more for the next post though… Now it’s time to get back to work!